The program can retrieve a bunch of useful data from switches, routers, and other network devices that support SNMP (in LANState Pro only). To access and read the SNMP information from a network device (like switch, router, or printer), find it on the network map, bring up the context menu (using the right mouse button), select System Information, and then SNMP Information. Each computer that has an active SNMP agent can provide various data to the program via SNMP. In the Windows XP/2003/Vista operating systems, the SNMP agent is implemented as a service called SNMP Service. 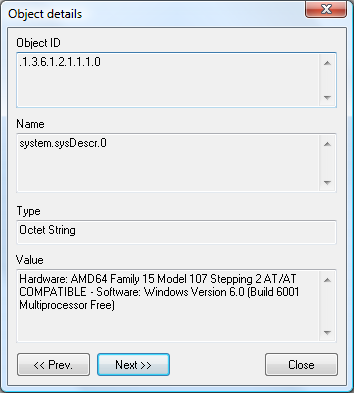 Read below how to install the SNMP service on a PC (it is disabled by default). It often happens that some network devices (such as routers, switches, network printers, etc.) have the SNMP agent present but not running. Normally, to enable the SNMP agent on a network equipment device, you need to open the device settings using its web interface, find a parameter like "SNMP Agent (Disable/Enable)", and enable the setting. 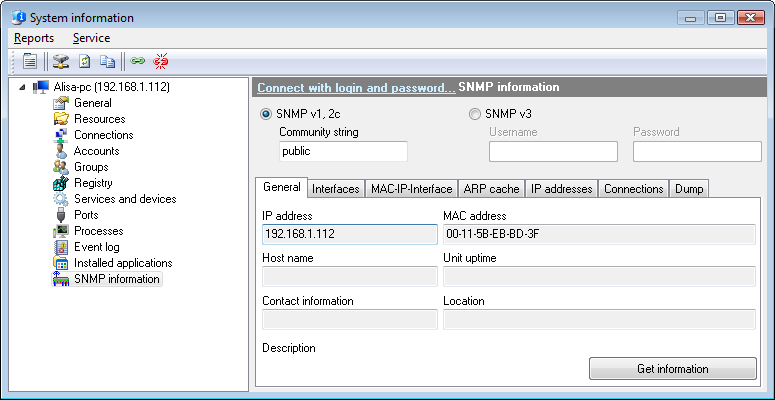 Take a note of the Community parameter (or User/Password for SNMPv3) and configure it for your successful authorization. Community - is a kind of a password for accessing the data in a device using the SNMP protocol (v1,2). Specify a correct password in the SNMP read community string field (Fig. 1). To obtain the data from the device, select a tab of your interest on the window and click the Get information button. All tabs (except the General tab) have the Save report button which allows saving the retrieved data to a CSV file. The Interfaces tab provides the information on network interfaces available in the device with a detailed information on the interfaces. In addition, the tab displays the network statistics on incoming and outgoing packets, which allows monitoring the network traffic usage on devices. The MAC-IP-Interface tab provides the information on the connection table (see the Switch connection table section). The Connections tab provides the information on current TCP and UDP connections of the host, state of the connections, remote/local port numbers, and remote/local IP addresses. The Dump tab provides the information on the entire data set that can be retrieved from the device via the SNMP protocol. The data receiving can take some time (it depends on the device type and performance). During this process, you cannot get information on other tabs of the window. You can save the retrieved dump data to a CSV file. To view the data in details, select a record on the list and make a double-click using your mouse. You can navigate through the records by clicking the Prev./Next buttons. Fig. 2: The Detailed view window. Warning! Installing the SNMP service with its default settings can be potentially dangerous for your computer's security. Before continuing with the installation, please learn the SNMP security issues (how to change community strings, etc.). To install the SNMP service, open Control panel, then launch Add or remove programs, click Add/Remove Windows Components, select Management and Monitoring Tools, and confirm your selection. The service will be installed and started. After the installation, please change the default community strings, passwords, etc. See also: SNMP monitoring, SNMP traps.